If you imagine your beach day in Sorrento, Italy as walking an endless stretch of silent sandy beach, you may be disapointed. 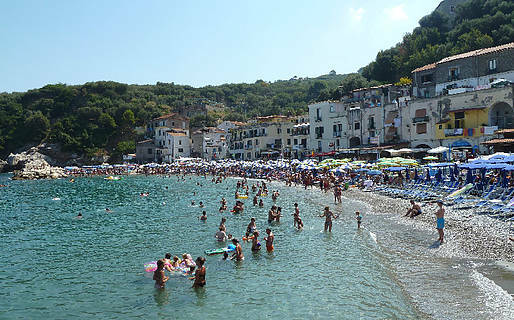 Sorrento's beaches are small and quite crowded, especially in the summer months. To enjoy the most beautiful beaches lapped by the crystalline waters you dream of, you'll have to leave the center of Sorrento. But the tiny, pristine coves and lack of crowds make it worth the effort! 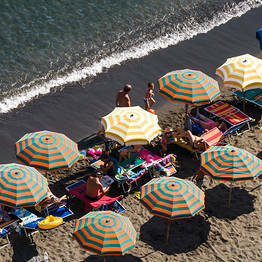 Beneath Sorrento's Villa Comunale and next to the port, there is a small strip of volcanic sand occupied by a number of beach clubs and a stretch of public beach. Most of the beach clubs have a small area of the waterfront and sundeck over the water, where sun loungers and umbrellas are set up. It costs around EUR 12 to rent a lounger and umbrella for the day. Almost all the beach clubs also offer restaurants and/or snack bars. Directions: from the Villa Comunale, take the elevator down (you'll find it near the Church of San Francesco). Otherwise, it's an easy walk from Piazza Tasso. 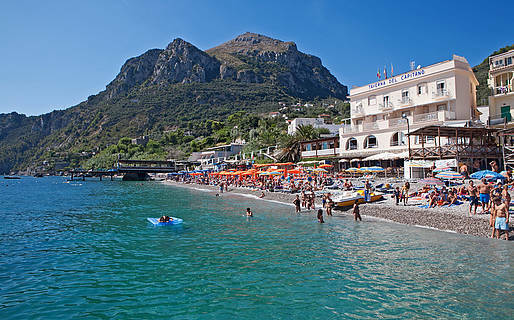 Marina Grande is Sorrento's fishing village, famous for its excellent seafood restaurants. It also has a small volcanic sand beach where you can bask before or after your memorable lunch. Directions: walk from Piazza Vittoria or take the local bus. 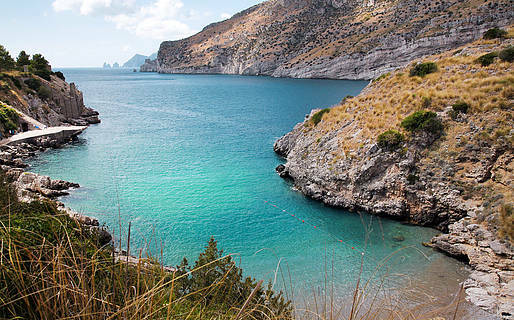 "Regina Giovanna" is what locals call the small tongue of land which juts out into the sea where the Roman ruins of Pollius Felix' villa still stand (also known at the Capo di Sorrento). 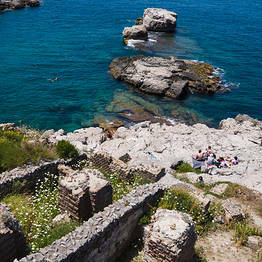 Through the ancient walls, you'll find a flight of stairs down to a small lagoon joined to the sea by an arch. This tiny private pool is where Queen Giovanna d'Angiò loved to bathe, hence the colloquio name of this stretch of coastline. It's the only place along the shore with easy access to the water, but it is in shade all day. On either side, the water's edge is bordered by large cliffs, making it more difficult to both dive in the water and, more importantly, climb back out. If you continue along the pathway to the left, you'll reach an area known as Solara, with flat-topped rocks where you can sunbathe and with easier access into and out of the water. There is also a private beach club here which rents sun loungers. Directions: take the bus (route A, Capo di Sorrento stop) or walk the 3 km from the center of Sorrento. There is also a parking lot nearby if have a car or scooter. 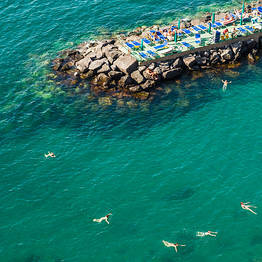 Locals from Sorrento particularly love the area known as Puolo, both for its beach and its easy access for families. There is a large stretch of beach here, and the water along the shore is quite shallow. 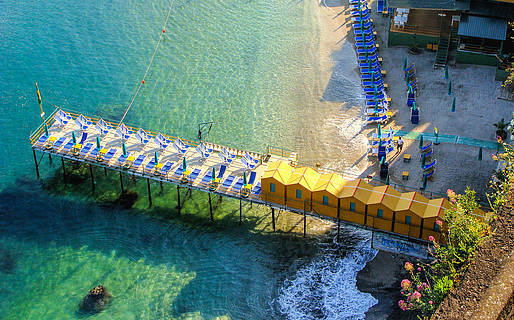 The free public beach includes the area known as Pignatella (with a rocky shore) and the sandy Puolo beach, which also has caffés, restaurants, and sun lounger and umbrella rentals. The private beach is run by the Blumare Beach Club, and access is through the white gate. Here there is both a stretch of beach and a sundeck. Directions: you can only reach Puolo by car or scooter. La Conca Azzurra is a private beach club just outside of Massa Lubrense. It includes three pools (including two kiddie pools), large sundecks, and a small rocky beach. Direction: you can only reach La Conca Azzurra by car or scooter. 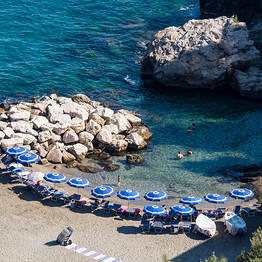 This small fishermen's quarter in the center of Massa Lubrense has a long stretch of rocky coast and a couple of beach clubs. Capitan Cook: a private rocky beach with an excellent restaurant. Baia delle Sirene: a private beach club with beach, sundecks, and a restaurant. 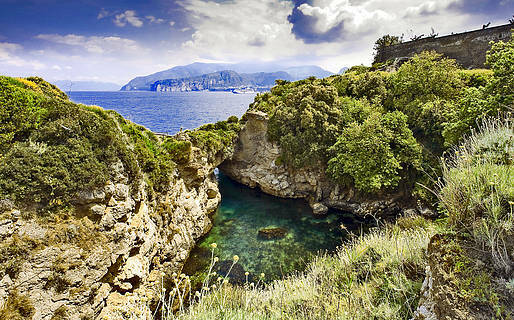 At the tip of the Sorrento Peninsula near the village of Nerano, you can take the walking path to the Baia di Ieranto, a natural protected bay which overlooks the island of Capri from its small beach (about an hour walk along the path). 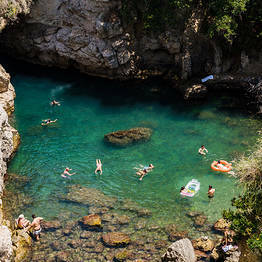 When you ask an Italian from Sorrento where they go to enjoy a day on the beach, chances are that they will answer, "Marina del Cantone, near Nerano!" This pretty bay on the south side of the peninsula has a large pebble beach, crystalline water, and a number of excellent restaurants serving the local specialty: "spaghetti alla Nerano", made with zucchini and provolone del Monaco cheese.